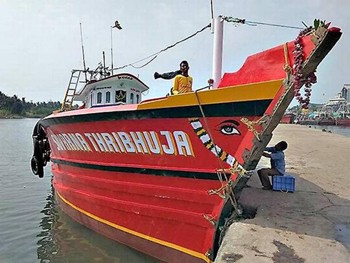 Udupi, Feb 01, 2019: Families of two of the seven fishermen on board the missing Suvarna Tribhuja fishing boat of Malpe, have claimed that the phones of the two had rang when they tried to call on Wednesday night and Thursday morning. The claim was made by the families of Ravi from Honnavar Manki and Harikantra from Kumta. However later the phones were found switched off. When Lakshman’s daughter tried to call at 7.24 pm and at 7.49 pm, the phone rang and later gave switched off signal. Even Ravi’s phone rang on Thursday morning and was later giving switched off message. However, the cops claim that the cell phones of the missing fishermen have remained switched off and the families might have heard them ringing due to jump in tower signals.